Now in its third year, A Menu for Hope is an event sponsored by food bloggers around the world to raise money for those in need. Through this raffle, authored by Pim Techamuanvivit of Chez Pim, food bloggers world-wide donate delicious, inspiring, awesome food-related prizes and encourage their readers to donate $10 for each raffle ticket for a chance to win and a way to help those in the direst of needs. This year's event begins today, December 11th and runs through December 22nd. Raffle winners will be announced on January 15, 2007. Please stay with me awhile and read through this entire post before clicking on. Many of your questions may be answered here. If you do click on a link then wish to return to my blog, please use your back button. Through A Menu for Hope, thousands of dollars were raised in 2004 and 2005 for victims of the tsunami of Southeast Asia and the earthquake in Pakistan. This year A Menu for Hope III will be raising funds to benefit the United Nations World Food Program which helps to provide emergency hunger relief around the world. And what better time of year than now for us who are more fortunate to help those who wake up each day wondering if they will eat, rather than what they will eat. West coast headquarters for this event is our very own Sam Breach of Becks and Posh. Sam has the list of prizes being offered by food bloggers from the West Coast of the US, of which I am one. You will see my raffle prize offering further down on this post. Head over to Chez Pim to see the entire list of Menu For Hope III Prizes and who is hosting the prize lists for the rest of the world. 1. Go to the First Giving donation page. 3. If your company matches your charity donation, please remember to check the appropriate box and fill in the information so the corporate match can be claimed. 4. Please check the box to allow your email address to be seen so you can be contacted in case you win. Your email address will not be shared with anyone. Just $10 per raffle ticket!! Many of us could go without our daily lattes just twice this week and use the savings to donate to this more than worthy cause. The more you donate, the more tickets you have and the greater your chances of winning! Made in Humboldt County is not just another label. Located in the far northwest corner of California, access to Humboldt County, especially in the winter months, can be cut off by mudslides, swollen rivers and high tides. Consequently, and luckily for us who live here, for over one hundred years local residents have had to rely on their own resources for food and supplies. 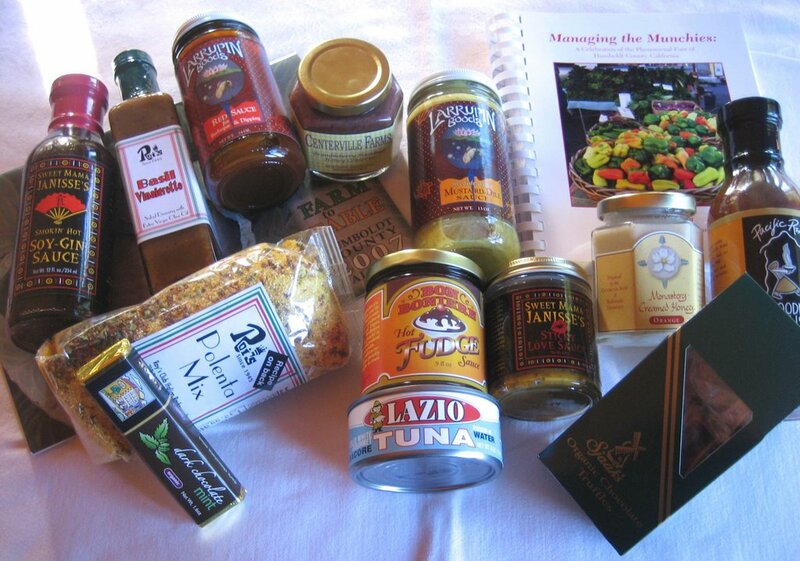 From local gourmet fisheries products to organic, hand-made truffles, the number of products that are made here in Humboldt county have become increasingly gourmet. They have also become more well known outside of the boundaries of the county. Fresh daily organic chocolate truffles, hot fudge sauce made especially for our locally produced ice cream, world-renown, gourmet water-packed albacore fished off the coast in local waters, spicy sauces from local restaurants, and much, much more have made their way into the hands of cooks and foodies around the world. SHIPPING RESTRICTIONS: Because of the considerable weight of this gift basket, I must restrict shipment to within the US, Great Britain and western Europe. Good luck to all of you! And please accept my personal thanks for making a donation that could not only win you prizes, but will benefit those in need world-wide. Let's put Humboldt on the world map! Mustard Dill Sauce! Ginger Orange Sauce! Orange Honey! What a great prize! I'm impressed with how generous people are. Let's hope we raise tons of money. Judging from the dollars raised on just the first day, this looks like it will be a record-breaking fundraiser. I'm so proud of our food blogging community. I'd like to remind visitors to this page that new raffle items will be added over the period of this fundraiser. Plus, each raffle prize will be reviewed in depth on Sam's site, becksposhnosh DOT blogspot DOTcom, over the next 11 days. So be sure to check back often! What a wonderful offering!! I had great plans for my own gifts to raffle off, but a family crisis here caused me to totally forget about the deadline. Oh well, next year for sure and I will certainly be making bids on different items. A great contribution from your end-thanks! Christine, that's a huge, generous basket of goodies! What's also nice is I discovered a new blog. I tried to leave a donation Christine with two different cards, it may just be it doesn't like foreign cards as the country box kept clicking back to USA box even though I kept putting in United Kingdom. I was going to buy a raffle for your lovely offering. It sounds a really great idea. Hi Jann, Thanks for your kind comment. Wow! I've been visited by a celebrity. Thank you so much for visiting my blog. I'm serious! I'm not sure what you mean by "card". I'll check the First Giving site to see if I can figure out what you encountered. Thanks so much for trying. I'll get back to you. I can personally vouch for the extreme addictive deliciousness of the Larrupin's mustard sauce. This basket would be worth winning for that one item alone! (I might have to bid myself, as my jar of mustard sauce in the fridge is getting woefully low). Jen(nifer), You're welcome. It was fun! For those of you in the dark, Jen was my Blogging By Mail secret partner this time around. I'll have a post up soon to explain.